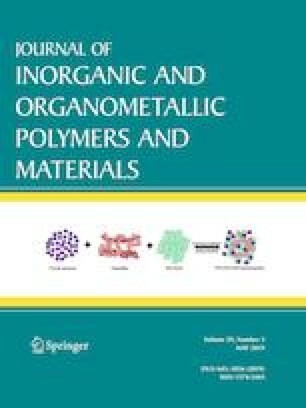 Organic–inorganic polymer hybrid films were prepared, using polyvinyl alcohol–polyethylene glycol blend as the organic host matrix. Silver sulfide (Ag2S) semiconductor particles have been synthesized in polymer blend matrix, by in-situ method. Polymer hybrid films, with various amounts of Ag2S were prepared and characterized structurally, optically and electronically by using various characterization techniques, such as Fourier transform infrared spectroscopy (FTIR), X-ray diffraction (XRD), Scanning electron microscopy (SEM), UV–Vis absorption spectroscopy, temperature and time dependent DC electrical studies. Hydrogen bonding interactions take place between hydroxyl groups (OH) and carbonyl groups (C=O) of polymer blend molecules with Ag+ ion of Ag2S filler, indicating complex formation between polymer matrix and filler, which is confirmed by FTIR technique. XRD results showed presence of additional multiple peaks (compared to pure blend film) corresponding to αʹ-Ag2S monoclinic crystal system. Changes in degree of crystallinity (%C) are observed for hybrid films with various amounts of Ag2S, showing a highest value of 18.2% for the film containing 0.372 g of Ag2S, when compared to 13.45% (%C) for pure blend film. Uniform distribution of Ag2S nanoparticles in polymer blend matrix is revealed by SEM analysis for hybrid film containing 0.372 g of Ag2S. UV–Vis absorption studies showed multiple absorption peaks due to added filler. Highest value of room temperature conductivity of 9.40 × 10−7 S/cm was obtained for the hybrid film containing 0.372 g of Ag2S. Values of transference numbers (tion and tele) in time dependent electrical studies indicated that the electrical conductivity in pure blend film as well as hybrid films is mainly due to ions. The authors are thankful to University Science Instrumentation Centre (USIC), Karnatak University, Dharwad, for providing facilities to carry out FTIR, UV–Visible characterization and acquire the data. We are also thankful to Innovation center, MIT, Manipal for recording XRD data and SAIF-STIC, Cochin University, Kerala, for providing SEM images. The first author acknowledges financial assistance in the form of fellowship, BCWD, Government of Karnataka, India.